Two separate sleeping areas, one bath studio unit can be rented as either single room (double bed) or double with separate bedroom and (Mexican) King size bed. Both rooms have air conditioning. 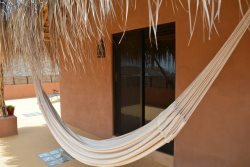 Outside you will find a large Palapa covered porch with a hammock for napping, table and 2 chairs, and 2 reclining chairs and ottomans. This area offers both garden and mountain views. Spiral staircase to roof offers ocean and mountain views and 2 chaise lounge chairs for relaxing and soaking up the sun. Kitchen is equipped with full size refrigerator, microwave, coffee pot, 2 burner cook top with pots, pans, dishes, silverware, and glasses. Note: for access to the second bedroom, you must have 3 or 4 guests in the reservation. Bathroom is in the main studio unit. WiFi in Bungalow and in the pool area.